With the latest release of vRealize Automation 7.3, the following very nice high availability improvements have been introduced. These important improvements, significantly help to make vRA even more robust and stable as ever before. This article introduces these two new cool features. For the people who didn’t know, with the introduction of vRA 7.0, VMware introduced the feature “Synchronous vPostgres replication” on top of the Asynchronous vPostgres replication feature. An important side note, is that Synchronous vPostgres replication could only be enabled when three vRealize Automation virtual appliances have been configured as a three node vRA cluster. Unfortunately, both vPostgres replication flavours require a manual failover of the vPostgres Database. Now with the 7.3 release of vRealize Automation, VMware enhances the Synchronous vPostgres replication flavour by introducing automatic failover. 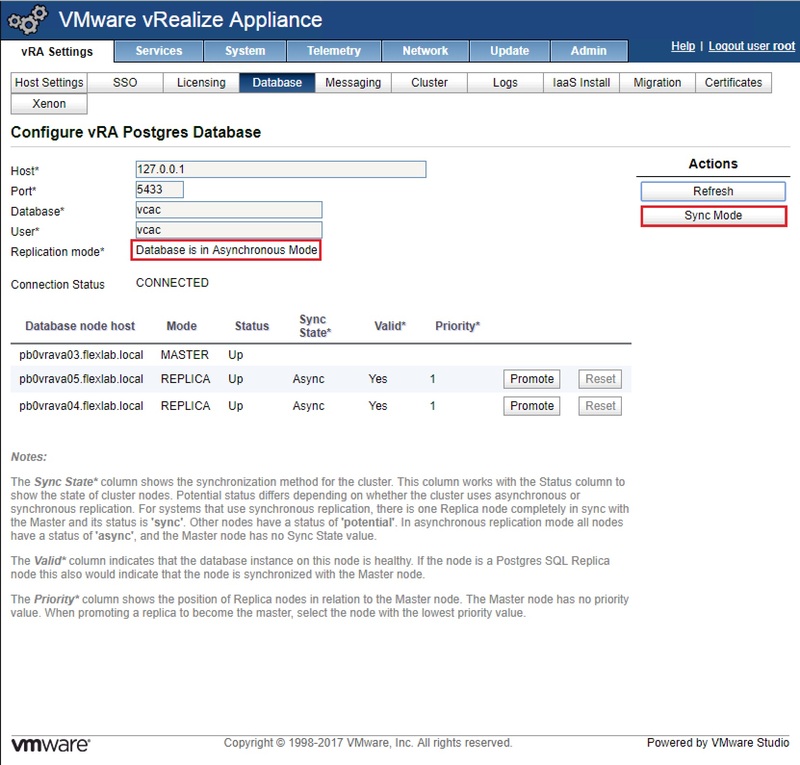 Configure three vRA virtual appliances as a three node cluster. Login to the VAMI interface of one of the three vRA virtual appliances and go to vRA Settings –> Database. Click on the Sync Mode Button. The IaaS Manager Server Service has always been there as an active / passive component with a manual failover mechanism. With the 7.3 release of vRealize Automation, VMware enhances the IaaS Manager Server Service component by introducing automatic failover. A big difference between all previous releases of vRealize Automation and the 7.3 release is, that the IaaS Manager Server Services have been started simultaneously on both Windows servers when using this automatic failover feature. There is also no need anymore to change configuration settings on the load balancer in the case of a failure. This failover over process is now fully covered on an application level. p.s.1: Automatic Manager Server Service failover is disabled by default if you install or upgrade the Manager Service with the standard vRealize Automation Windows installer. You can use the command “python /usr/lib/vcac/tools/vami/commands/manager-service-automatic-failover ENABLE” from one of the vRA virtual appliances to enable this feature manually. p.s.2: You can use the the command “vra-command list-nodes –components” from one of the vRA virtual appliances to discover which Manager Server Service has been configured as the active node and which one has been configured as the passive node. As always, please enjoy using this awesome product!